In his masterly book A Concise History of Western Music Paul Griffiths explains that “The past is not a path we and our predecessor's have travelled but a labyrinth, and a labyrinth forever in flux”. Concert planners usually view the musical past as a narrow path that must be followed closely, and as a result they produce predictable programmes that overlook the many riches hidden in the labyrinth of music history. So how wonderful to see the King of Hearts in Norwich departing from the familiar narrow path for its Autumn Festival, and challenging performers to explore the musical labyrinth. This Journey Across Time provided fascinating perspectives. Not only was it a rewarding musical experience, but it was also very enlightening to see how both audiences and performers responded to the challenge of musical diversity. The Festival started rather unpromisingly with a recital by violinist Catherine Macintosh and harpsichordist Maggie Cole. These performers are no strangers to contemporary music, and played two works by Stephen Dodgson, including his Inventions which are dedicated to Maggie. But, despite this, the music was presented in a strangely detached way, rather like being introduced to a teenage relative with body piercings. But perhaps it wasn’t just the contemporary music. The Bach and Biber in the programme were rather like being introduced to an elderly relative with a taste for Agatha Christie. Not the most vibrant of starts, and not helped by empty seats. Teenagers with piercings may be the norm outside in Norwich's Magdalene Street, but sadly they are a lot less popular in the King of Hearts. No lack of spark in the lunchtime Bach from King of Hearts’ regular Carolyn Gibley. There may have been a capacity audience, but her Journey Across Time stopped at 1750, apart from one singularly inappropriate pastiche item. I know Carolyn is quite upfront in her preference for eighteenth century harpsichord music. But a work such as John Palmer’s Koan from 1999 would have taken us much further into the labyrinth than P.D.Q. Bach. Different strokes for different folks, and both The London Handel Players and Jane Chapman proved just how rewarding exploring the labyrinth can be. Bohuslav Martinů’s Promenade for flute, violin & harpsichord from The London Mozart players showed that twentieth century music need not be feared, while, in the same concert, Rachel Brown’s performance of a work for flute and tape by Barry Guy eased the King of Hearts into the age of electronica. Either by luck or good planning Aude Gotto had left the best to last. 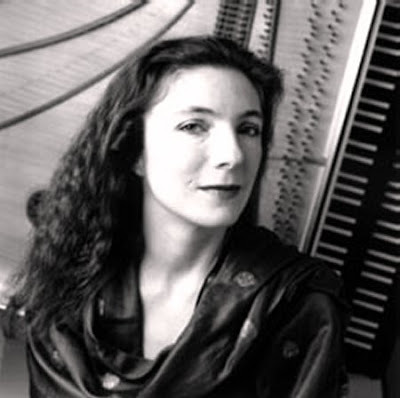 Jane Chapman (photo above) fears nothing in contemporary music. No tokenism or apologia in her harpsichord recital, which went for the jugular with music by Gyorgy Ligeti, Tōru Takemitsu, plus a first performance, with the composer present, from Jeremy Peyton-Jones who is right there in the labyrinth as a colleague of John Cage. Those that chose the competing television coverage of England losing the Rugby World Cup final instead of Jane’s recital missed a real opportunity to celebrate. The concerts by The London Mozart Players, Jane Chapman and others were a triumphant endorsement of the vision of a Journey Across Time. I really don’t feel that in 2007 I should be making the case for contemporary music. But the empty seats at several of the concerts suggest I should. If you only feed children baby food they never develop proper teeth, and can’t move on to a nourishing diet that allows them to grow. There is too much baby food in today’s concert programmes and radio schedules. Contemporary music is the aural equivalent of the spicy Hungarian goulash served in the King of Hearts restaurant after Jane Chapman’s inspirational recital. More please Aude. There is too much baby food in today’s concert programmes and radio schedules. I really don't see that slagging the music for which a majority of concert-goers will pay is any help at all. Does the case for contemporary music depend on trashing the other fare on offer, or was this just a bad-tempered outburst? Scott, it may apply elsewhere, but I hope that we are not yet at the point On An Overgrown Path where putting forward a point of view is considered to be "a bad-tempered outburst". An awful lot of people eat at McDonalds. That doesn't make the fare on offer there a balanced and healthy diet. Bob, I reacted to what came across to me as an insulting and pointless comparison. Saying that someone is consuming "baby food" doesn't sound friendly or helpful to me, regardless of how accurate you may feel it is. However, since it appears that we simply see this issue quite differently, I withdraw my "bad-tempered" comment. I'd like to mention one aspect of "promoting" contemporary music - the different presentation types. Somewhat simplistically, there are four - concerts and radio programming with each subdivided into "specialist contemporary" and a mixture of contemporary and other. I live just north of Toronto Canada. Complete concerts of contemporary music have been pretty well served here in my experience. Example - an organization called New Music Concerts, founded in 1971 and directed by Robert Aitken. Lots of lovely stuff, and they make an effort to have the composers present to speak to the audience. One fond memory is of a concert of the music of Toru Takemitsu, with Takemitsu introducing each piece. As you'd expect, such concerts are held in small halls, and you get to recognize quite a number of the other audience members over time. "Regular" concerts are a different matter. Contemporary music is there, but most often with short pieces done before intermission. To be fair, the Toronto Symphony does commission some pieces, with the composer introducing the premiere. Local radio is mixed. A private, largely classical station has little contemporary stuff. CBC Radio 2 programs some contemporary music, but they recently canceled the long-running and excellent "Two New Hours" on Sunday evening. It specialized in broadcasting recent concerts, often with the composer in the studio to comment. Great stuff ... but it's gone. It seems to me that the game has to be to find a way to encourage more contemporary music in "mixed programs." As a listener, I try to poke at this by sending complimentary e-mails when I've heard a worthwhile contemporary piece on the radio or in concert. I've also turned away subscription requests from the Toronto Symphony by explaining that I knew most of what was being programmed, and more new music would help. Sometimes I get someone who seems interested. Small things, to be sure, but I suspect that bottom-up audience reaction has considerably more leverage than top-down encouragement. Scott, thanks for that informative piece. There is no problem at all over 'baby food', we are just putting two different meanings on it. I didn't intend it to be a perjorative, but rather as an illustration that a varied diet, both gastronomic and musical, is essential to development. It probably didn't communicate very well, but that's what I meant. When our son was very young we took him to Madeira on holiday. I contracted food poisoning and ended up eating his baby food - it's not that bad!